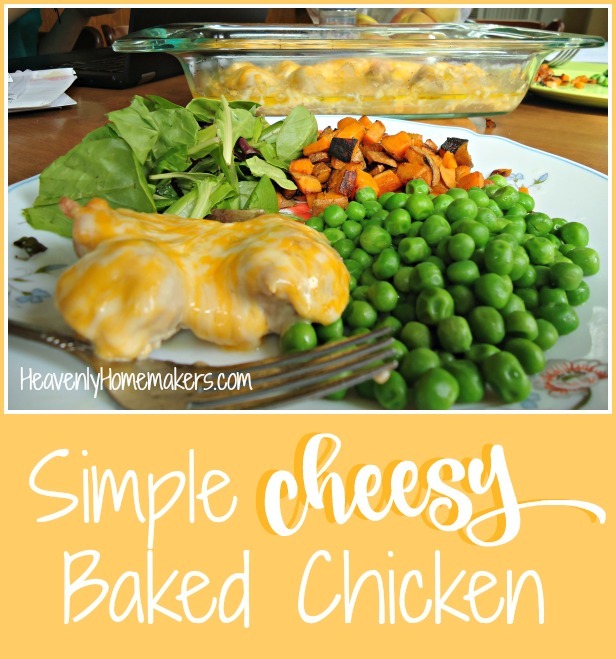 This Cheesy Baked Chicken recipe is unbelievably simple! I was skeptical at first. I thought it might turn out boring or dull, dry or flavorless. Turns out, the flavor is perfect, the chicken is juicy, and then there’s the cheese. Cheese makes everything better. In keeping with the Simple Recipes theme we have going on here, this recipe can be made with about five minutes of effort. While the chicken is baking, you can quickly make some veggie side dishes. 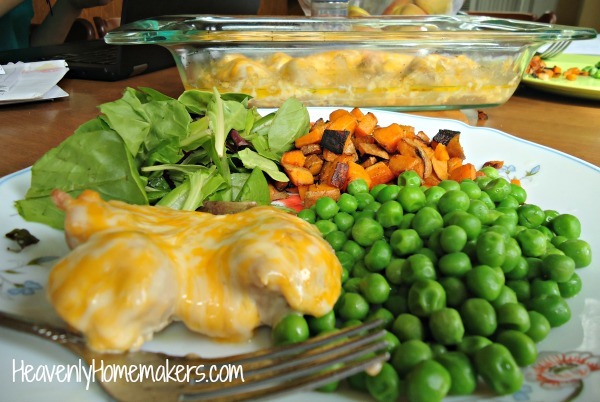 We first enjoyed this chicken with fried sweet potatoes, tossed salad, and buttered peas. It was crazy easy and so, so delicous. Place chicken in a baking dish. Drizzle olive oil over the chicken and sprinkle with garlic powder and salt. Bake, uncovered, in a 350 degree oven for 20 minutes. Sprinkle cheese over the chicken and bake for 10 minutes more or until cheese has melted. Allow me to put in a word again for using boneless chicken thighs instead of boneless chicken breasts. The thighs have more fat in them, so they are always juicier and more flavorful. I’ve found the price for thighs to be about the same, if not better than what I’ve found for breasts. I’m also enjoying the fact that I continue to find a natural brand of chicken marked down for quick sale at the store. I know it’s not the best of the best when it comes to chicken, but it is at least better than the worst. (You like my logic, there?) I grab all the marked down packages I find, often getting 2-pound packages for about $3.00, and freeze them for when I need them. What a huge money saver!